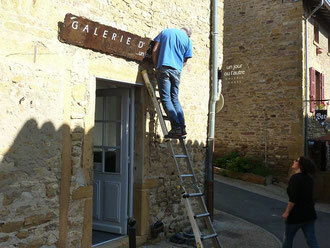 on vient de poser l'enseigne "UN JOUR OU L'AUTRE" sur la porte de la galerie. La date d'ouverture se rapproche. Le plus gros de l'installation est quasi terminé, il ne nous reste que des bricoles à faire. On devrait être prêt pour le jour J : le 29 juin ! I have been exploring for a little for any high-quality articles or weblog posts on this kind of area . Exploring in Yahoo I eventually stumbled upon this site. Studying this information So i am glad to convey that I have an incredibly just right uncanny feeling I found out just what I needed. I so much undoubtedly will make sure to don?t fail to remember this website and give it a glance regularly.